The first time I returned to China I went together with my good friend Jack Ho. We came from the same 台山市Taishan city, and his town 广海Guanghai, is only about a half-hour ride from my own, which is 都斛Duhu. After a few days stay in our villages we got together and headed up north to 北京市Beijing city for the first time. We were excited and for a week we went sightseeing, mostly on tours organized by our hotel because we didn't know any better. We took the rail back to 广东Guangdong, our home province, and after farewells to our relatives we flew out from there. Beijing was our only stop. That was winter 1994, right after my graduation from Pratt Institue. In the time between my first trip and the next, I read up on China. Then in the summer of 2001, I returned to China again. This time I went alone. I got around several provinces and visited many scenic and historical sites. The experience was transformative. After returning to the States I decided on returning to China every two to three years. In the process I would document the country in as many ways as I know how. After the third trip in 2004, I thought of some outlets to share it. Immediately the idea of a website came up and its format suited well to my needs. It took me on and off for a year to know web development sufficiently and design this website. Finally, on Mid-Autumn Festival day (September 18,2005), it was officially launched. As intended, this website acts as a personal journal, recording what I see and think in the process of moving through China's land and history. 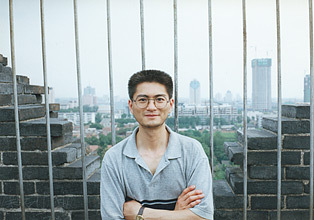 西安市小雁塔顶 Atop Xian's Small Wild Goose Pagoda - 2001 I came from a village of a small town in Taishan City, Guangdong Province. After a year in school, my family left the mainland. We stayed a short while in Hong Kong before moving on to New York City, where I have been staying ever since. In my school years here I was given a traditional American education. But because I had an early interest in art, my own education moved in that direction. My earliest institutional art training was in LaGuardia High School of the Arts. Later, I went to Brooklyn's Pratt Institue and graduated with a Bachelor of Fine Arts degree. My major was sculpture; however, a large part of my output is now photographs. After graduation I took some time off to return to China to travel. While travelling there for the third time in the autumn of 2004, I decided to build a website to hold together my images and thoughts. So, for some time I worked on it. Finally, on Mid-Autumn Festival day (September 18,2005), it was up in the Way.